The Bel Air girls crack the El Paso Running Top 10 for the first time this season. They Highlanders placed fourth at Skyline Park. 1. Eastwood:The Troopers rested last week. They will race at the 38thWoodbridge Cross Country Classic in Irvine, Calif. Eastwood will compete in the Girls Varsity Rated Race at 9 p.m. Saturday. 2. Franklin:The Cougars won its third championship of the season, taking the Chapin Invitational at Skyline Park with 34 points, 14 points in front of Americas. Franklin runners finished 1-2-8-11 and 12. Eva Jess took individual honors finishing the partly desert course in 19:15.11. Amalia Dorion was third in 20:58.52. Franklin will run the Hanks/Ysleta Invitational at Northeast Regional Park on Saturday. 3. Americas:The Trailblazers placed second at Skyline Park with 48 points. Daphne Duran again led the way finishing fourth in 21:00.14. Priscilla Villalobos was fifth 21:05.44 and Lauren Anderson was sixth in 21:12.85. The Trailblazers will not race this week. 4. Eastlake: Eastlake did not race. They are expected to race at the Northeast Regional Park. 5. Coronado: The T-Birds ran at the Southlake Carroll Meet where senior Jennelle Jaeger-Darakjy placed 11thout of 163 runners in 19:37. Coronado will compete at Northeast Regional Park on Saturday. 6. Montwood: The Rams did not race on Saturday. They will compete at the Loretto/Cathedral Invitational at Veterans Park. 7. Socorro:The Bulldogs move up three spots after its third place finish at Skyline Park with 66 points. Jazmin Chacon paced Socorro finishing seventh in 21:18.41. The team will travel to Arvada, Colorado to race in the Arvada West Invitational. 8. Horizon:The Scorpions did not race on Saturday. The team is scheduled to run at Veterans Park on Saturday. 9. Clint:The Lions did not run a full team last week. They will run at Veterans Park. 10. Bel Air:The Highlanders make its Top 10 debut after its fourth place finish at Skyline Park. Bel Air’s top five finished 16-18-19-27-28 for 108 points. Bel Air take a week off before returning to action Sept. 22 at the Franklin Invitational at the Haskins Recreation Center. Americas junior Daphne Duran has been the lead runner for most of the season for the Trailblazers. She has the city’s fourth fastest time, clocking a 19:07.87 at the Race to Midnight Invitational at Socorro’s Student Activities Center. 1, Aeriel Garcia, Eastlake, 18:18.45 (Race to Midnight, SAC, 8/17). 2, Eva Jess, Franklin, 18:44.37 (Del Valle, 9/21). 3, Mariana Guzman, Americas, 19:06.79 (Race to Midnight, SAC, 8/17). 4, Daphne Duran, Americas, 19:07.87 (Race to Midnight, SAC, 8/17). 5, Priscilla Villalobos, Americas, 19:08.71 (Race to Midnight, SAC, 8/17). 6, Amaris Chavez, Eastlake, 19:20.34 (Race to Midnight, SAC, 8/17). 7, Amalia Dorion, Franklin, 19:29.21 (Canutilllo Invite, 8/25). 8, Jennelle Jaeger-Darakjy, Coronado, 19:37.00 (Southlake, 9/8). 9, Lauren Walls, Eastwood, 19:42.68 (Canutillo Invite, 8/25). 10, Karyme Garcia, Montwood, 19:54.27 (Race to Midnight, SAC, 8/17). 11, Eileen McLain, Eastwood, 19:56.74 (Canutillo Invite, 8/25). 12, Lauren Anderson, Americas 20:07.55 (Race to Midnight, SAC, 8/17). 13, Meadow Ortiz, Eastwood, 20:09.16 (Canutillo Invite, 8/25). 14, Morayma Montes, Austin, 20:15.24 (Race to Midnight, SAC, 8/17). 15, Deserie Herrera, Eastlake, 20:21.12 (Race to Midnight, SAC, 8/17). 16, Diane Mena, Montwood, 20:26.84 (Race to Midnight, SAC, 8/17). 17, Skyler Goodman, Chapin, 20:28.66 (Canutillo Invite, 8/25). 18, Ruby Medina, Eastlake, 20:33.11 (Race to Midnight, SAC, 8/17). 19, Stephanie Gastelum, Eastlake, 20:22.11 (Race to Midnight, SAC, 8/17). 20, Caitlin Martinez, Eastlake, 20:40.10 (Race to Midnight, SAC, 8/17). 21, Giselle Rubio, Eastlake, 20:40.30 (Race to Midnight, SAC, 8/17). 22, Victoria Duran, Americas, 20:56.82 (Race to Midnight, SAC, 8/17). 23, Kenia Enriquez, Horizon, 20:59.37 (Del Valle, 9/1). 24, Britney Martinez, Loretto, 21:00.34 (Canutillo Invite, 8/25). 25, Rosemary Torres, Bel Air, 21:01.89 (Race to Midnight, SAC, 8/17). 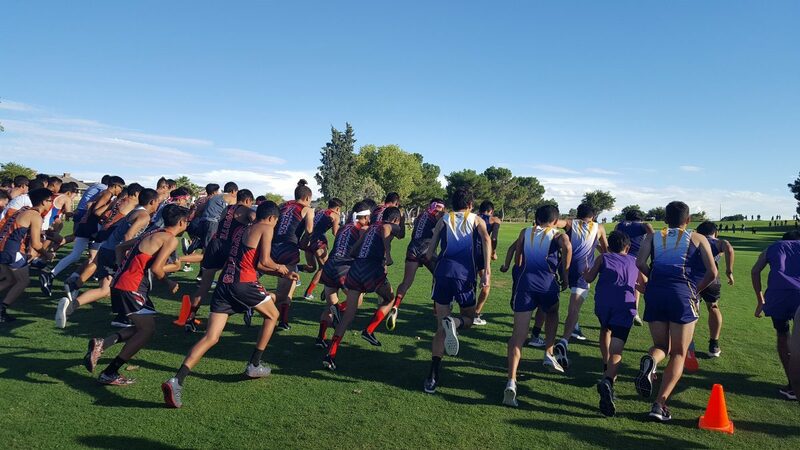 There are two major cross country meets in El Paso on Saturday – the Hanks/Ysleta Invitational at Northeast Regional Park and the Loretto/Cathedral Invitational at Veterans Park. Both start at 8 a.m.
1, Eva Jess, Franklin, 40 (4). 2, Amalia Dorion, Franklin, 31. 3, Angeline Lujan, Parkland, 29 (2). 4, Jennelle Jaeger-Darakjy, Coronado, 27. 4, Aeriel Garcia, Eastlake, 27 (1). 7, Skyler Goodman, Chapin, 20. 8, Marisol Hernandez, El Paso, 16. 9, Morayma Montes, Austin, 15. 9. Lauren Walls, Eastwood, 15. 9, Natalie Jimenez, Burges, 15. 9, Priscilla Villalobos, Americas, 15. America Morales, San Elizario, 14.